It sounded great – the “Expert Meeting on the Impacts of Relevant West Coast Development Projects on the Humpback Dolphins and Integrated Impact Reduction Measures”. What more all-encompassing assessment could those concerned about the effects of unrelenting coastal industrial development on Taiwan’s critically endangered humpback dolphin population have asked for? Well, perhaps one that in some way reflected the intention suggested by this superb title. Now two such meetings have been held, and green groups are at a loss for positive words to describe the results. 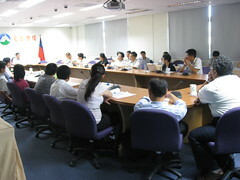 Shortly before the first “expert meeting” on 1 June the host – Taiwan’s Environmental Protection Administration (EPA) - sent participants copies of a report that was to be discussed. Given the several dozen major development projects adjacent to or upstream of the dolphins’ habitat, it seemed somewhat inappropriate that the sole subject of the report was Taiwan Power Company’s (Taipower) Changgong Coal-Fired Power Plant, proposed for construction on the Changhua County coast. Although the expert meeting had indeed originally been proposed during an assessment meeting for the Taipower project, the impacts of one single power plant could hardly represent the diverse forms of pollution, land and water use, freshwater exploitation and underwater noise associated with all the other projects up and down the west coast. And with its all-inclusive title the EPA clearly meant to discuss the enormous collective load of all the projects on the dolphins…didn’t it? So staff members of Wild at Heart Legal Defense Association did what they considered to be the EPA’s homework and put together a list of thirty-one projects that would likely cause major environmental changes relevant to the dolphins. This included several river damming and diversion projects, coal-fired and offshore wind power plants, petrochemical and hi-tech science parks, a steel plant and a harbour expansion project. On 1 June, Wild distributed the list to the EPA and its expert committee. Participants from Changhua Coast Conservation Action, Changhua Environmental Protection Union, Matsu’s Fish Conservation Union, Taiwan Academy of Ecology, EAST and Green Party Taiwan all echoed Wild’s concerns that any meeting purporting to address the combined impact of all west coast projects should live up to its name. Participating groups also challenged the quality of the Changgong power plant report, prepared by Dr. Lien-Siang Chou of National Taiwan University (NTU), as not meeting even basic scientific standards, failing to cite major relevant published reports, omitting important data, making inaccurate statements and demonstrating a bias. (Dr. Chou was hired by Taipower to carry out their study of the potential impacts of the power plant on the dolphins). The committee concluded that Taipower would have to gather more information on the dolphins and suggest ways in which the company proposed to reduce the impact of the power plant on the population, and also that no decisions could be made based on the information that had been presented. However, no solution was offered regarding the glaring problem of the other thirty projects. Not one of the other projects featured in the second expert meeting on 31 July, either. Instead, a revised report by Dr. Chou focused on what the Changgong coal-fired power plant would not do to the dolphins – e.g. it would, apparently, not involve noisy pile-driving or obstruct their north-south movement along the coast - but failed to even mention the plant’s air pollution as a potential threat to the air-breathing mammals. Regarding other sources of noise pollution during construction, Dr. Chou recommended adopting the 180 decibel (dB) threshold, used by the US National Marine Fisheries Service (NMFS), as the noise level at which Taipower should temporarily stop construction and start thinking up noise reduction measures. In fact, 180 dB is the noise level at which the NMFS claims permanent physiological damage can occur in cetaceans (although scientists argue that lower noise levels can also lead to such damage). It is also widely acknowledged – also by NMFS – that noise levels far lower than this can have other important effects such as temporary hearing loss and behavioural impacts, which can be equally life-threatening to animals so dependent on acoustic signals for survival. Therefore, the adoption of a 180 dB threshold would show almost no precaution, allowing all possible levels of impact to occur - even permanent hearing loss - before noise reduction measures would be triggered. In response to the concerns over the continued treatment of Taipower’s power plant as a proxy for all west coast cases, the chair of the meeting, Dr. Fan Kuang-Lung, a professor of oceanography at NTU, brushed these aside, and finally dismissed everyone but the expert committee for a closed door session. The committee’s conclusions were that 1) west coast developers should act in accordance with Taiwan’s Wildlife Conservation Act (which says that humpback dolphins are a Level One protected species and, hence, affords them the highest level of protection from human activities); 2) the dolphins could be impacted by habitat destruction, pollution (including noise pollution), reduced sources of food and fisheries interactions, but that the extent of these impacts was not yet known; and 3) careful assessment of the potential for west coast development projects to cause these impacts is recommended. The disappointment (apart from the fact that freshwater exploitation was omitted from this version of the now two-year-old list of major threats to the population) is that these conclusions only confirm what has been said repeatedly since at least as far back as the second international workshop on Taiwan’s humpback dolphins in Changhua City in 2007, although this is largely a symptom of the lack of detailed, accurate information provided to committee members - what more could they have said? Also, although this was by no means unexpected, the EPA unfortunately seems no closer than before to addressing the combined, synergistic impacts of the myriad sources of anthropogenic disturbance along the west coast. One wonders whether the title of the meeting was an attempt by the EPA to establish a set of unspecific or irrelevant statements that could be applied arbitrarily to all projects in order to shuttle them through the EIA process, or the brainchild of a sensible, well-meaning junior official, who might then have been reprimanded for thinking out of the box. Either way, the EPA appears bent on denying the only logical interpretation of the title of its own meeting. The hint of a silver lining glimmers, albeit very modestly, around the fact that the dolphins’ legal status has now been acknowledged by an expert committee appointed by the EPA. However, whether and how this will be reflected in action over the following months of project impact assessments will depend very much, as always, on the work of representatives from green groups attending and monitoring the EPA’s meetings.